Check this page often for community events and fun that may interest you and your student. Join together with others from the Cincinnati region for the annual Autism Speaks Walk at Coney Island — show your support for the needs of the Autism Community. Rockin’ Jump Trampoline Park offers a monthly "Sensory Jump Time" the first Tuesday of every month. Individuals with special needs and their family members can jump and socialize in a comfortable, friendly environment. Showcase Cinemas, Springdale offers Sensory Sensitive Screenings the first Saturday of every month. Guests may dance, cheer, clap, sing or otherwise engage with the movie. Lazer Kraze in Mason, OH, and Erlanger, KY, host a Special Needs Night the first Thursday of every month. Players with special needs may bring a friend or family member to play laser tag or in the trampoline park for FREE with the purchase of their own paid admission. Sound and lighting accommodations have been made to ensure an enjoyable experience for everyone. Sensory Level guides on Touch, Sight and Sound will be provided, as well as designated calming areas. The Boonshoft Museum of Discovery offers Sensory Sundays throughout the year. During special hours, the Museum will adjust lighting and sound, have trained volunteer and additional staff, and offer special programs for those who benefit from a less stimulating atmosphere. 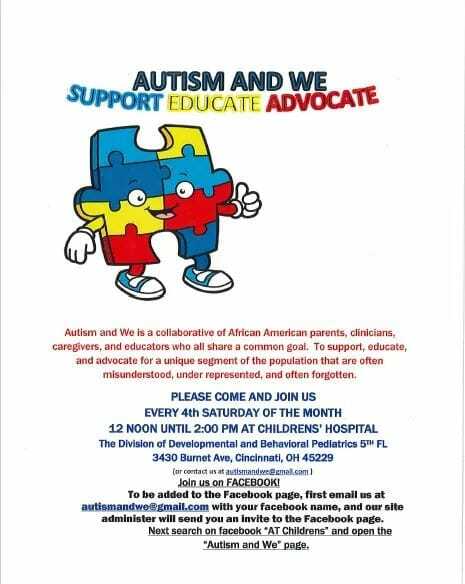 Autism and We is a collaborative of African-American parents, clinicians, caregivers and educators with a common goal to support, educate and advocate for a unique segment of the population that are often underrepresented. This program is designed for families to explore the art museum before public hours, from 9-11 AM. Families can also participate in an all-ability art making activity! The event is free with no reservations required. CVG's LIFT program helps families with ASD and other disabilities become more familiar with air travel. Registrants must attend the April 17 and April 27 sessions. School to Adult Life Transition Series (SALT) is a FREE monthly series developed to help students with special needs transition from school to adult life. Parents attend an information session while students (ages 13+) participate in fun interactive activities. Two-hour course for caregivers discussing resources available through the division of Developmental and Behavioral Pediatrics at CCHMC, as well as other community supports and services. Enjoy a night of swimming, snacks, and activities at the Clippard Family YMCA. These evenings are for individuals in the autism community and their families. You do not have to be a Y member.